When I asked Alida which recipe she considers her favourite in her new recipe book Cook From The Heart she told me that she had three favourites. These are her recipes for gnocchi with Gorgonzola cream (page 77), cheese stuffed arancini (page 222) and this lemon syrup pudding (page 62). In preparation for reviewing the recipe book I wanted to make a recipe that would be good enough to be on the cover. Alida describes this recipe as ‘edible sunshine’ and she is not wrong. I made the lemon syrup pudding in the middle of summer but chose a coldish day so that we could enjoy it warm. We also enjoyed it the following day straight out of the fridge! Given that my readers come from many countries, and that a tablespoon measure is not the same in South Africa as it is in Australia, I prefer using grams and millilitres in my recipes. I have given the recipe here using my measurements. I also used half the water and sugar quantities for the syrup that Alida did. I had run out of fructose and that was all I had left in my container. However, it was more than enough. As I had used 1 lemon, which is the same as the recipe book, the result was a serious lemon taste! I loved that it came out of the oven with such a crispy top. Disclosure: I was sent the book to review by Penguin Books South Africa. This recipe forms part of the review that I will be doing and is published with permission. This post is in line with my blogging policy. this pudding is very very appetizing Tandy! We need as much sunshine as possible and having that in the form of a cake sounds great. Anything with lemon for me – looks delish. Lemon pudding? 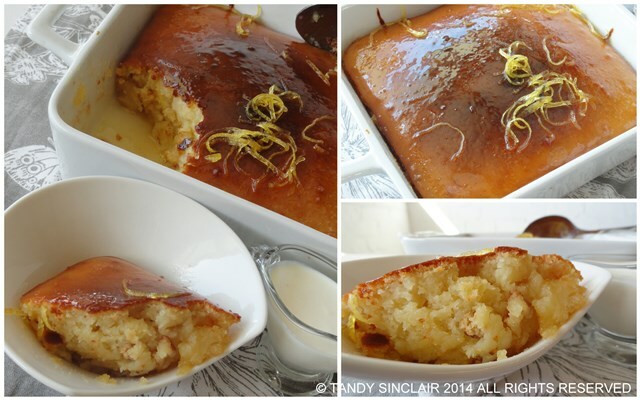 Looks delicious Tandy…I love all kind of dessert with lemon…perfect for Spring! I don’t make them often enough! Tasty and lemon smelling delicious? Yes, please! I’ve always wanted to try a pudding like this instead of the kind we think of in the US, which has more of a yogurt-like consistency. The lemon flavor sounds lovely! You will love this with your Meyer lemons! A gorgeous, proper, old fashioned pudding – yum! I love intensely lemon flavoured desserts and my mom used to make me a lemony lemon cake every year for my birthday. Your pudding looks so beautiful. Definitely sounds like a winner of a recipe Tandy. Oh my! It is lemon season here and that looks terrific. Please let me know how this works with the GF flours! What a lovely recipe, the name edible sunshine is spot on. Still have lemons coming out of my ears here, Will be making this soon.